The 14-mile loop is short and flat through a forested area south of Bethel. Although ME 35 and ME 5 have no paved shoulders, the traffic volumes are light. This is a good introduction to road cycling. 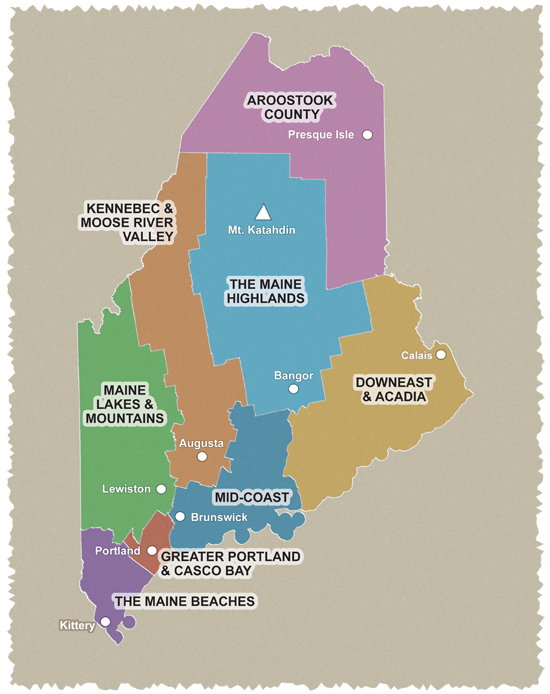 The 18-mile loop meanders along the Androscoggin River with great views of the countryside. The 33-mile loop takes you to one of the area’s most famous landmarks—the Artists’ Covered Bridge. The 67-mile loop is truly a classic northern New England ride—great during spring, summer, or fall when the leaves turn color. Plan to spend two days on this splendid and challenging ride. This ride heads south through the foothills of the White Mountains. Along the way you will enjoy views of three mountain ranges and scenic Evans Notch, part of the White Mountain National Forest. The final leg follows the North Road that winds its way to Bethel hugging the Androscoggin River. Bicyclists are rewarded with more views of the White Mountains and area rivers and lakes. All loops start from the pretty four-season resort town of Bethel. Road conditions: Narrow roads with no shoulder except for US 2. Wider road bike tires recommended. Cautions: Narrow road at Evans Notch and rough pavement along route. Some roads with no shoulders. Starting point: All rides originate at the Davis Park/Bethel Pathway parking lot at the junction of ME 26 and Parkway Road. Please park out of the way of picnickers.